Within the last two weeks ESPN and Tim Kurjian (top ESPN sportswriter) have both come out with their top 10 list of the all-time greatest baseball players. 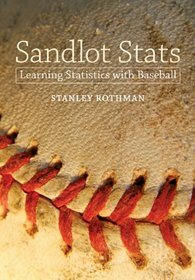 In the final chapter of my book “Sandlot Stats: Learning Statistics with Baseball,” I produced my own top 10 list of the greatest all-time hitters in baseball. The 3 lists appear below. Players were given points for ranking in the top ten for their careers for the statistics AVG, OBP, SLG, OPS (OBP + SLG), Runs Created [(#H+#BB)*TB / (#AB+#BB)] , HRA (#HR/#AB), #H, #HR. Bill James’s Black-Ink Test score was used. The Black-Ink Test awards 4 points for leading the league in home runs, runs-batted-in, and batting average. Three points are awarded for leading the league in runs scored, hits, and slugging percentage. Two points are awarded for leading the league in doubles, walks, and stolen bases. One point is awarded for leading the league in games, at-bats, and triples. Bill James’s Gray-Ink Test score was used. This test awards the same points as the Black-Ink Test except points are awarded if the player finished in the top 10 in each of the statistics.Players who finished in the top ten in either test got 5 points. Special consideration was given to a player who achieved either a Triple Crown Award or a Career Triple Crown Award, who batted .380 or above for a season, who had a consecutive hitting streak of at least 40 games, who finished his career with at least 3000 hits, hit at least 50 home runs in a season, or had at least 500 career home runs. Players were given credit for winning an MVP Award. If you are interested in how each player got their points, please read Chapter 18 in my book. So how do these three lists compare? 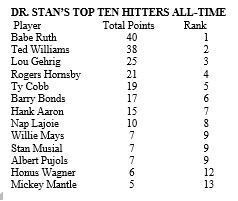 To no one’s surprise the BABE is number one on all 3 lists. My list has Ted second while the other 2 lists put Willie second. I can understand this since if you combine hitting with fielding and running there is a good argument that Willie was better all-around than Ted. But if you just look at hitting there can be no argument that Ted is number two. The only active player on any of the 3 lists is Albert Pujois who is on my list. Mantle appears on the other 2 lists but ranked 13th on my list with a total of 5 points. 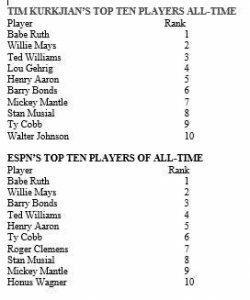 I object to the exclusion of Lou Gehrig from the top 10 ESPN list. Another objection is the exclusion of Rogers Hornsby from the other two lists. From 1921 to 1925 Hornsby had a cumulative batting average over .400. Note that even though the other two lists included pitchers only one pitcher made it on each of their lists. Thanks Matt R for your praise. It is amazing how close my list is to the ESPN list considering I excluded pitchers and running and fielding for hitter.